Application Period Still Open - Forest to Classroom FIRE Focus! The Forest to Classroom (F2C) professional development program was created to connect educators to forest resources in North Carolina and assist with implementing forestry education in the classroom. Forestry remains one of North Carolina’s top industries, with over 18.6 million acres of forestland in the state, providing $18.5 billion in economic output and employing over 70,000 citizens (2013 data). The 2018 F2C program is dedicated to FIRE. Wildfires have been in the news. 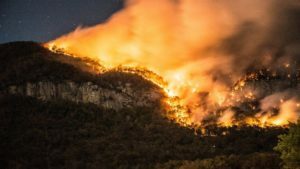 Western North Carolina was a hot spot beginning in October 2016 as 26 major wildfires burned over 62,000 acres. Communities affected by the fall wildfires clung together to support and champion the suppression efforts of the state’s and nation’s firefighters who answered the call for help. Could it happen again this fall and winter? More information, including a link to register, can be found by visiting http://forestry.ces.ncsu.edu/f2c. Space is limited and filling quickly! At this time, we are only accepting applications from formal and nonformal educators that work with students in 6-12th grades based on the complexity of information and activities we will be providing. Questions? Please contact Renee Strnad, NCSU Extension Forestry, at renee_strnad@ncsu.edu.